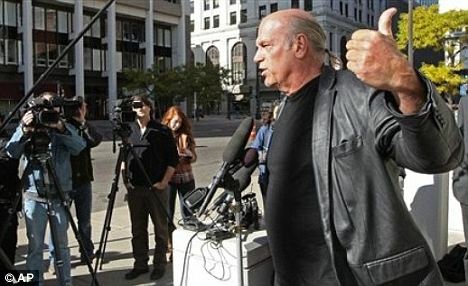 Former Minnesota Governor Jesse Ventura is so upset by the dismissal of his airport security lawsuit that he threatened Friday to apply for dual citizenship so he can spend more time in his beloved Mexico. But don’t think he’s camping out south of the border forever — he hinted that he might need to run for president of what he labelled as ‘the Fascist States of America’ in order to fix the problem. Mr Ventura, also a former wrestling star, sued the U.S. government in January, alleging that airport scans and pat-downs amounted to unreasonable search and seizure. A district judge threw out his lawsuit Thursday, ruling it should have been filed in a Circuit Court of Appeals. Mr Ventura has said a titanium hip implanted in him in 2008 sets off metal detectors and that agents previously used hand-held wands to scan his body. He said he was subjected to a body pat-down after an airport metal detector went off last November. Mr Ventura said he hasn’t flown since and won’t fly commercially again because private planes do not require the same level of security checks. Outside the federal courthouse in St. Paul, Minnesota, with a crew from his ‘Conspiracy Theory’ cable TV show filming, Mr Ventura said he hadn’t decided whether to continue pressing his lawsuit. He said he wanted to make his case before a jury, not a panel of judges. Mr Ventura, a political independent who served one term as governor, teased that he might have to run for president to change the policy and a court system he regards as broken. Moments later, he vowed to apply for Mexican citizenship so he can live there more months of the year. The former Navy SEAL said he had lost his patriotism. ‘I will never stand for a national anthem again. I will turn my back and I will raise a fist,’ he said. I’m reading one of his books at the moment and fully appreciate his disillusionment. The country is now so irretrievably corrupt it needs a proper revolution and a brave principled leader with solid honest support.